Gavin Jackson speaks with Seanna Adcox (l) and Jeffrey Collins (r) live on stage at The White Mule in Columbia, SC, on Thursday, January 3. 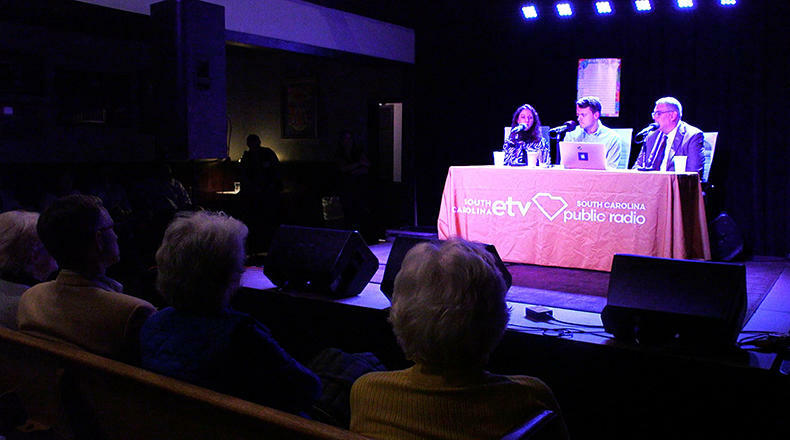 On this special edition of South Carolina Lede, recorded live at The White Mule in Columbia, SC, host Gavin Jackson is joined by Seanna Adcox, assistant Columbia bureau chief for the Post and Courier, and Jeffrey Collins, South Carolina reporter for the Associated Press, to preview the 2019 legislative session. South Carolina Public Radio’s own Statehouse Reporter Russ McKinney also drops by to quiz Gavin and the audience on South Carolina history. You can subscribe to South Carolina Lede in Apple Podcasts, Google Play, and Stitcher. You can also follow the show on Instagram and Twitter. On this special edition of South Carolina Lede, recorded live at Munkle Brewing Co. in Charleston, host Gavin Jackson is joined by The Post and Courier reporters Jamie Lovegrove, Thad Moore and Caitlin Byrd to recap the top stories of 2018. The group discusses the midterm elections, the upset in the 1st Congressional District, the ongoing V.C. Summer boondoggle, the future of education in South Carolina and other surprises of the year. South Carolina Public Radio’s own Statehouse reporter Russ McKinney also drops by to quiz Gavin and the audience on Lowcountry history.